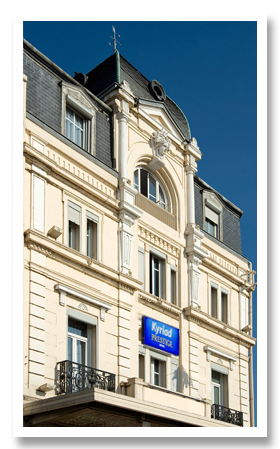 The Hotel Kyriad Gare in Dijon is located opposite the main train station, a stone’s throw away from the city centre. Housed in a beautiful early twentieth-century building, the Kyriad Gare boasts all the comforts of a 3-star hotel. Each of its 80 rooms is air-conditioned, soundproof, and contains a spacious and comfortable en-suite bathroom. The hotel also features several function rooms, which can be reserved for conferences or professional events. The hotel’s relaxation spaces include an indoor heated pool, a bar, a gym and a sauna. Open all year round and 24 hours a day, the hotel also has a private underground car park. 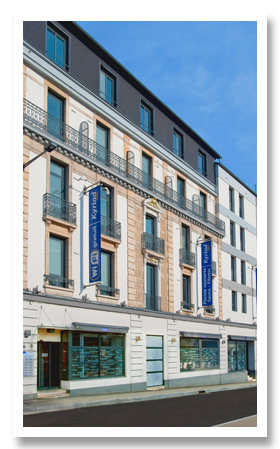 The Hotel Kyriad Prestige — Dijon Centre is located in a newly renovated district in the heart of the city centre. Situated close to the main train station, tram network, pedestrian zones and the historic old town, this 3-star hotel is resolutely modern in style. The hotel features a relaxation area and 30 spacious rooms, newly refurbished with a stylish and contemporary decor, and providing a range of features to make your trip more comfortable, including: an iPod dock, flatscreen television, telephone, free Wifi, iron and ironing board, and double-glazed windows. A private car park is also available. A short walk from the most historic monuments of the Burgundian capital, the hotel Kyriad Prestige — Dijon Centre gives its guests the opportunity to discover the city centre, its museums, its historical and tourist attractions, and its world-famous gastronomical delights. 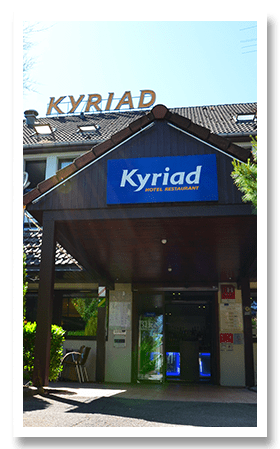 The Hotel Kyriad Mirande in Dijon is located in a lush, green part of the city, a short walk from the Quetigny golf course and close to the University of Burgundy. The hotel is easy to access from the motorway, and offers two free external car parks, each with a capacity of 60 vehicles. The rooms were renovated in 2011, and comprise all the quality and comforts one would expect from the hotel’s 3-star rating. Meanwhile, its practical and adaptable function rooms are equipped with everything necessary to make your professional and personal events a success. The hotel’s restaurant, “Chez Marco”, serves delicious food in a modern setting full of original design features. Its menu offers a wide choice of traditional dishes and regional specialities. The hotel’s relaxation spaces will be available throughout your stay, and include an outdoor heated pool, a gym and a weights room.